And in this section we can try more intricate folds and ideas at the same time. Try some of the ones listed below. Each link takes you to a new page with instructions on how to achieve that project. Make pretty flowers for your cards, using paper punches or a die-cutting machine. or simply with scissors and your fingers. If you can crochet then make some flowers to attach to your creations. And if you can't ... then it's very easy to learn and this website will help you with the process and clicking the link will open a new window for you to browse. Make a bow from beautiful ribbons, or create a flower as your centre piece from brightly coloured ones. There are several video tutorials to show you some of the lovely things that you can make with this cheap embellishment and they are all easy to follow. 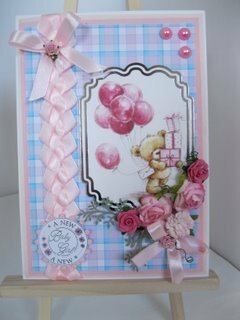 Making your own embellishments to give your cards the added magic, and to save you money, are just some of the topics covered. Click the links below to look at individual card-making-projects that you may like to try. Some of them look complicated, but once you have mastered them they are a pleasure to do. Practise some of the folds on cheap card, until you have your confidence, and then see what you can produce on the real thing. New card-making-projects will be added often, but to get you started take a look at some of the other links at the bottom of the page. And please pop back regularly to keep up to date with everything that can help you, as a card maker, to make beautiful creations you will be proud to give.